Y’all missed us, didn’t you? 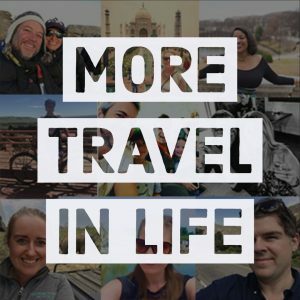 Well, we’re ready here for Season 2 of the More Travel in Life Podcast, with more interviews and more creative approaches to travel. Oh wait… Are you new around here? Perfect. I’m wrapping up Season 1 and summing up all my biggest learnings from each guest. And if one specifically resonates with you, dive into the whole episode! There is a ton of goodness in each one. Plus, we all get different insights from listening, so don’t take my word for it… I’d love to hear what you got out of it. Have you wanted a more travel-focused lifestyle but …there’s a job that seems like a big obstacle, you have a mortgage so feel a bit more tied down, or you’ve got little ones that can make it seem hard to travel more? We’re finding examples of folks that are creatively embedding more travel into their lives, through their jobs, despite mortgages, and with their kids. It’s different strokes for different folks, but maybe one particular approach punches you in the gut and you think, “I want that,” and more importantly, “I could do that!” We’re sharing stories and inspiration. Thank you for the podcast reviews! Your written iTunes reviews help other people find this new podcast. Thanks for the amazing support. For those that read below the fold… you get a treat. Here are my 3 favorite and universal themes and takeaways from the episodes–and for travel overall. Be intentional. Make curiosity a priority. Seek out opportunities and situations that can put you in new surroundings, around new people, with new perspectives. It’ll expand your mind and soul, and you’ll likely return with surprising confidence. Just ask. See how you can ask for support to make a dream trip happen. Ask for flexibility from work, ask for the universe or God to help you find the right resources, or ask a conference you want to attend how you can volunteer for a discount. Trust your gut. Trust that idea that you get very suddenly to visit friends, or to make an epic trek, or an almost budget-impossible trip. And once you say it out loud, just watch what conspires around you to help you bring it about. Listen to the 15 minute episode here because these are just 3, and there’s much more insight in the audio. Let me know what takeaways you’re getting from the podcast or from a specific episode. And let me know if there’s a question you have whether people have done this or that, or what you’re curious to hear about. We’ll get right on it.